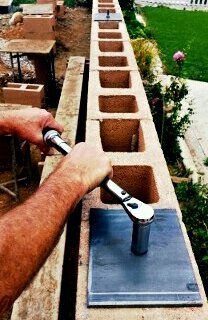 Masonry unit, that is brick or concrete block is laid to or bound together with mortar to make a masonry wall. We make masonry wall for various purpose. Some masonry wall is made for protecting property as barrier, some are for boundary of a property and some are for separating a floor into useable spaces. Some masonry walls are also used as part of structures. So it is important to know about the masonry wall types so that you can understand where to place which type of wall. If a masonry wall carries load which is imposed on it to foundation then it’s called a load bearing masonry wall. This type of wall is made with brick, concrete block or stone. It acts as a part of structure and is more economical than the RCC frame structure. It can be build as interior or exterior wall. The thickness of load bearing masonry wall depends on the load imposed on it. This wall can be reinforced or non-reinforced. When reinforcement is used in masonry wall then it is called reinforced masonry wall. This type of wall can be load bearing or non-load bearing. The purpose of using reinforcement in a masonry wall is to help it to withstand against tension forces and heavy compression forces. Reinforcement also protect the wall from cracks and makes the wall strong to fight against lateral forces which forms during earthquake. Reinforcement is used in this type of wall both in horizontal and vertical direction at required interval. In this type of masonry wall a cavity or hollow space is left inside the wall to prevent moisture penetrating inside the building from outside. A hollow masonry wall also control inner temperature of a building by preventing outer temperature passing through the wall. The wall which is constructed using two or more masonry units is called composite masonry wall. 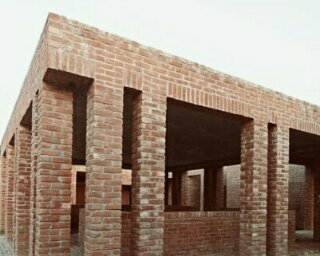 Such masonry units can be bricks, stones and hollow blocks. 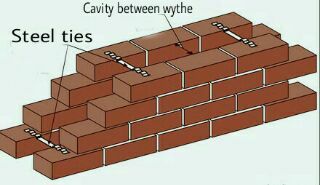 In this type of wall two wythe of masonry units are bonded together and connected by horizontal joint with reinforcement or steel ties. To understand what wythe is – read this post. Post-tensioning is done to strengthen a masonry wall to withstand against the tension forces cased by earthquake and wind. Running post-tensioning rods between wythes or masonry units and anchoring them into foundation this kind of wall is constructed. After ending curing period of masonry wall the rod is tensioned and anchored at the top of wall with a steel plate. I thank I explained the different types of masonry wall clearly for easy understanding. If anything confuses you leave a comment below. Great Post!! you have explained very well about different types of Masonry buildings which cleared my doubts about this topic and on similar note recently i have came across this article about crack types, causes and it’s repairing methods of masonry building.i hope you will like it too.